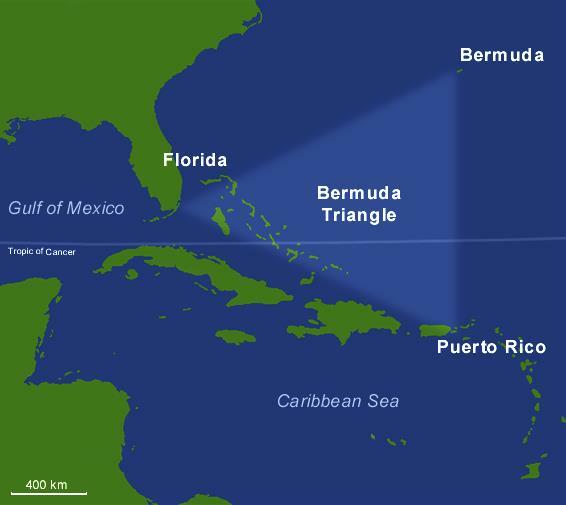 The Bermuda Triangle is the name given to an area of the ocean between Florida, Puerto Rico and Bermuda. The term was coined by Vincent H. Gaddis in 1964, when he wrote an article about how over 1000 lives had been lost in the area. There is no argument over the fact that many ships and boats have gone missing here ─ after all, it is a very heavily sailed part of the ocean, so wreckages are going to be common. The more important question is whether the number of disappearances is greater than expected. Larry Kusche, who published The Bermuda Triangle Mystery: Solved in 1975, concluded that the number of disappearances that have occurred within the area was not any greater than other similarly trafficked areas of the ocean. Lloyds of London, the insurance giants (who have a strong financial incentive in accurately assessing risk), came to the same conclusion. The disappearances that have occurred all seem to have rational explanations. First of all, the area is prone to very violent and unexpected storms (it is also right in the path of many Atlantic hurricanes). Waterspouts (tornados at sea) occur here and could cause untold damage to passing ships and planes. On top of this, the Gulf Stream runs through the area; not only can it catch out inexperienced sailors, sweeping them offshore away from where they expect to be, it can also rapidly dissipate any wreckages making them hard to find. Add to this the presence of some of the deepest ocean trenches in the world, and you can easily see how some shipwrecks may never be found. One final human explanation is the prevalence of “pirates” in the area in the 1970s and 80s. These “Pirates of the Caribbean” were not stealing gold and treasure, but stealing boats that they could then use to smuggle drugs.